This table is a work in progress. I still need to add discussions that have happened in other venues, including the IGF and ITU. I welcome feedback on making this timeline more complete and/or easier to read. 18 November Enhanced cooperation in the context of Internet governance is born when Member States at WSIS Phase II agree to include a reference to it in the Tunis Agenda for the Information Society. May Nitin Desai appointed by the UN Secretary General to write a report on enhanced cooperation. September Nitin Desai completes his Report on Consultations on Enhanced Cooperation. August Secretary-General requests United Nations Department of Economic and Social Affairs continue the consultation process and to facilitate the reporting process on enhanced cooperation on public policy issues pertaining to the Internet. 12 March Under-Secretary-General for Economic and Social Affairs invites nine organizations to provide annual performance report on the steps taken towards enhanced cooperation on Internet-related public policy issues pertaining to the Internet. IETF, a tenth organization, responds as well. 30 May The draft resolution on WSIS implementation developed at the 11th Session of the CSTD “looks forward to the report [on responses received from the nine organizations sent letters in March] to be prepared by the Secretary-General”. 19 December UN General Assembly resolution, Information and communication technologies for development (A/RES/63/202), requests UN Secretary-General submit to ECOSOC in 2009 “a report which may contain recommendations on how the process towards enhanced cooperation should be pursued”. 23 December Under-Secretary-General for Economic and Social Affairs writes to same 10 institutions, further requesting recommendations on how to pursue the process towards enhanced cooperation. 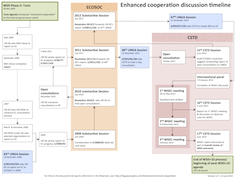 Six institutions respond (Council of Europe, ICANN, Internet Society, ITU, OECD and W3C). Four do not (UNESCO, WIPO, NRO, and IETF). 13 March The report of the UN Secretary-General, Progress made in the implementation of and follow-up to the World Summit on the Information Society outcomes at the regional and international levels (A/64/64–E/2009/10), submitted for consideration at the 12th Session of the CSTD, includes a brief report (less than one page) on enhanced cooperation that summarizes the responses received from the 10 organizations contacted by UN DESA in 2008. 27 May The draft resolution on WSIS implementation developed at the 12th Session of the CSTD asks the UN Secretary-General to report to ECOSOC through CSTD on enhanced cooperation progress. July UN Secretary-General submits a detailed report, Enhanced cooperation on public policy issues pertaining to the Internet (E/2009/92), to ECOSOC. ECOSOC decides to defer discussion on the issue until its 2010 substantive session. 18 May The 13th Session of the CSTD holds a multistakeholder panel discussion on enhanced cooperation (see pages 16 and 17 of report of the Session). 21 May The 13th Session of the CSTD draft resolution on WSIS implementation invites the UN Secretary-General to convene open and inclusive consultations before the end of 2010 to assist “the process towards enhanced cooperation in order to enable Governments on an equal footing to carry out their roles and responsibilities in respect of international public policy issues pertaining to the Internet but not in respect of the day-to-day technical and operational matters that do not impact upon those issues”. The draft also requests tha the outcome of the consultations be submitted to the UNGA through ECOSOC. July ECOSOC resolution 2010/2, Assessment of the progress made in the implementation of and follow-up to the outcomes of the World Summit on the Information Society (E/2010/31, chap. I, sect. A, draft resolution I, and E/2010/SR.39) invites UN Secretary-General to convene open and inclusive consultations before the end of 2010 to assist “the process towards enhanced cooperation in order to enable Governments on an equal footing to carry out their roles and responsibilities in respect of international public policy issues pertaining to the Internet but not in respect of the day-to-day technical and operational matters that do not impact upon those issues”. 14 December Face to face meeting in New York on open consultations on enhanced cooperation on international public policy issues pertaining to the Internet. Open consultations open to organizations with consultative status with ECOSOC or WSIS accreditation. (See also conference room paper). 31 December Deadline for written submissions to open consultations on enhanced cooperation on international public policy issues pertaining to the Internet. Open consultations open to organizations with consultative status with ECOSOC or WSIS accreditation. 4 May UN Secretary General submits report, Enhanced cooperation on public policy issues pertaining to the Internet (A/66/77-E/2011/103), for consideration at ECOSOC substantive session in July. 25 July ECOSOC resolution 2011/16, Assessment of the progress made in the implementation of and follow-up to the outcomes of the World Summit on the Information Society(E/2011/31) , decides to forward the report of the Secretary-General on enhanced cooperation to UNGA for consideration at its sixty-sixth session to enable Governments on an equal footing to carry out their roles and responsibilities in respect of international public policy issues pertaining to the Internet but not in respect of the day-to- day technical and operational matters that do not impact upon those issues. 22 December UNGA resolution, Information and communications technologies for development (A/RES/66/184) requests the CSTD Chair to convene, in conjunction with CSTD’s fifteenth session, a one-day open, inclusive and interactive meeting to identify “a shared understanding of enhanced cooperation on public policy issues pertaining to the Internet, in accordance with paragraphs 34 and 35 of the Tunis Agenda”. The resolution also requests the Secretary-General include information on the outcome of the meeting in his report on the status of the implementation of and follow-up to the UNGA resolution. 18 May CSTD holds half-day meeting on enhanced cooperation on public policy issues pertaining to the Internet. 22 May CSTD Chair reports to 15th Session of the CSTD on the 18 May consultation (see Summary Report). A panel then discusses various views on what enhanced cooperation is and how it can be implemented (see archived presentations by Parminder Jeet Singh, Emily Taylor, and Saudi Arabia). 25 May 2012 In the process of developing draft WSIS resolution, CSTD Member States cannot reach agreement on how to proceed with enhanced cooperation, so CSTD decides to simply recommend forwarding the Chair’s report of the open consultation to the UNGA. 24 July 2012 Using the draft resolution crafted during the 15th Session of the CSTD, ECOSOC resolution 2012/5, Assessment of the progress made in the implementation of and follow-up to the outcomes of the World Summit on the Information Society (E/2012/31, chapter I, section A, draft resolution I and E/2012/SR.43), resolves to forward the CSTD Chair’s report of the Enhanced Cooperation Open Consulation to the UNGA. 21 December UNGA resolution, Information and communications technologies for development (A/Res/67/195), invites the CSTD Chair to establish a working group to examine the mandate of WSIS regarding enhanced cooperation through seeking, compiling and reviewing inputs from all Member States and all other stakeholders, and to make recommendations on how to fully implement this mandate. The WG is to report to the 17th Session of the CSTD in 2014 as an input to the overall review of the outcomes of WSIS. 7-9 January CSTD Intersessional Panel discusses how to proceed with the UNGA’s request to create a working group on enhanced cooperation. It is decided to use the same multistakeholder composition as the CSTDWG on IGF. 30-31 May CSTD WGEC holds its first meeting. 4 June WGEC Chair reports on first meeting to 16th Session of the CSTD. 1 July CSTD to publish WGEC questionnaire. 31 July Deadline for responses to WGEC questionnaire. 6-8 November WGEC second meeting. Late February/early March CSTD WGEC submits its report to for consideration at 17th CSTD session. May 17th CSTD session may include text related to the WGEC recommendations in its draft WSIS resolution for ECOSOC.